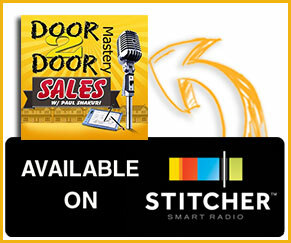 Welcome door to door mastery fans! 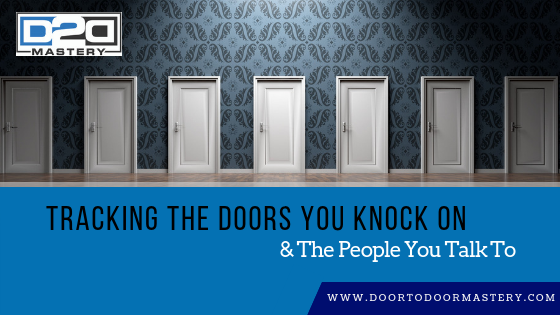 Today we are going to be taking questions from individuals who are trying to master and uncover the key to door to door sales. Right now I want to tackle this question, “Hey Paul I just want to know do you track where you knock? Do you keep some kind of record?“. That’s an excellent question! No, the truth is that I don’t. When I originally started I was given a tracking sheet to track where I knocked. I am not totally against it! Let’s make sense of this!. First, the sales rep that are what I like to call “road runners“, where they knock from door to door and do not lock and engage with customers and move from customer to customer, I recommend you keep track of your customers and who spoke with you on your turf and who you didn’t speak with. So you can make sure to go back to those people who didn’t answer the door. Now, I am a person who engages with my customers and I end up holding meaningful conversations which in turn allows me to recall instantly who I spoke with and who I didn’t speak too. I am able to recollect the conversation and recognize the individual instantly. If someone does tell me to come back, I do not usually come back just for anyone. I usually tell the customer I am usually busy and ask them if they like and want to honor what I have to offer if they do I offer to collect their name and phone number to come by again and finalize the deal. The sales rep that goes back to that one sale may have missed the opportunity to close those other fifty accounts. I give customers a reason to do business right now and that is why I don’t track my potential customers and I don’t burn through doors. I just don’t knock door after door after door. I do rework areas and hit the area again to see if customers change their mind and recall what I was offering to communicate with them. I may not track but I meticulously make sure I take care of my potential customer and see who else is tracking in that specific area. The next question I want to tackle focuses on my Masterd2d.com program. The question asks if the is for every company. This is very important and again another excellent question. The program is for cold calling, door to door salespeople. A lot of marketing individuals utilize my program because it is not just necessarily for door to door sales. 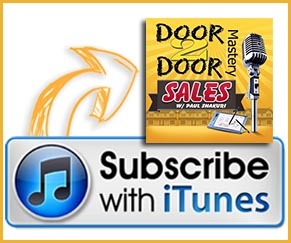 However, it teaches the entire process from A-Z on door to door sales. It also tackles growing your own business and teaches you how to learn how to sell packages. So it is also for those who own businesses and want to increase the number of sales that they get or the number of customers they get. The managers that aren’t so good at training their sales reps or those who are planning to manage a team of sales reps down the road the program is very good for them because the program is filled with expertise training in cold calling and knocking on doors. It outlines opener pitch to closing pitch. It introduces scenarios and how to overcome rebuttals and objections from customers. It teaches you how to communicate on an entirely new level. This program has everything you’re looking to grow as an entrepreneur. Thank you so much for following this blog. Keep the questions coming and remember to get Masterd2d.com program to better serve you and your potential customers!